Don’t let the basic ingredients of this soup fool you, because let me tell you, it is quite tasty. Thanks to the onions, pepper and chives you get lots of flavor and the addition of sour cream makes it just creamy enough to be delicious. 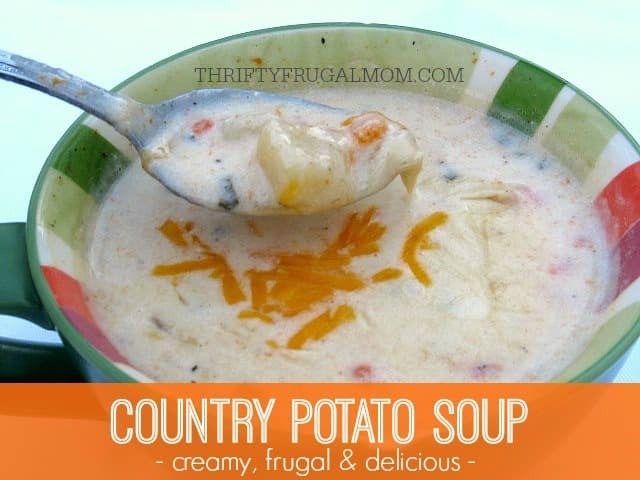 In fact my husband who is not really a potato soup fan declares this one to be “pretty good.” And I love that it’s a frugal dish too! Combine potatoes, carrots, onion, water, bouillon cubes, pepper and salt in a large saucepan. Cover and cook for about 20 min. or until potatoes are tender, but not mushy. Add 1 c. milk, heat. Combine sour cream, flour, chives and remaining 1 c. milk. Stir mixture into soup gradually. Cook over low heat, stirring constantly until thickened. Hey! I just love your recipes! Do you have them in a print version where it would be easier to print them? I don't have the time with 3 littles to write them out..
Stephanie, thanks for your sweet compliment! Getting my recipes set up so that there is a print option has been on my blog to-do list for a long time....but unfortunately the amount of time that I have to devote to blogging is always much less than my to-do list demands. I do hope to get it done though sometime between now and Feb., although obviously that doesn't really help you now, does it? My best suggestion for now is to simply copy and paste the recipe to a blank document and then print it out that way. And thanks for letting me know that you would find a print option helpful! I value hearing from my readers and knowing what they want and what they would fine important and helpful helps me know what to prioritize and what to work on. So thank you for taking the time to comment! Blessings to you as you care for those 3 littles! :) I know how busy and demanding that can be as a mom.